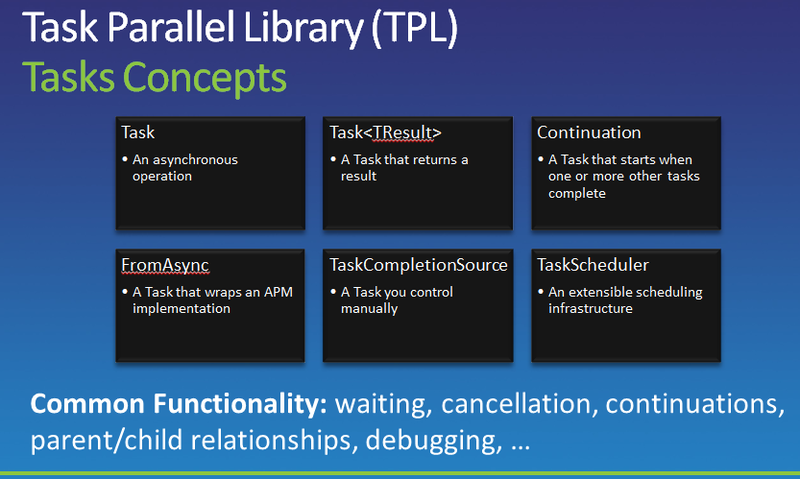 The new Task Parallel Library included in .NET4 is an incredibly easy way to parallelise processing, that would otherwise have to be done with such devices as SpinLock, Semaphores, Monitors and others. Unfortunately those previous devices were crazy easy to get wrong, and remember how they worked after 6 months has elapsed. One of my favourite sessions at TechEd this year showed in some detail how to Parallise various code fragments using the new constructs. Loops are the easiest place to start (shortly followed thereafter with reconsidering all LINQ statements). I believe the Chunking algorithm is the default, and usually is an ok choice for most things. Except if you are looking for a certain grouping of data, for example searching a list of people and processing the first one of a series of duplicates, then you should use the Hash algorithm. I think its pretty safe to say we would all recommend deregistering/unsubscribing events when we are finished with them. I know I was told when learning about events years ago, that if you do not, memory leaks would result. After looking into the GC recently I thought it might be interesting to get some specifics around this. So, what happens when you don't unsubscribe from events and just pray the GC can figure it out? Unsurprisingly some objects stay alive a lot longer than they should. 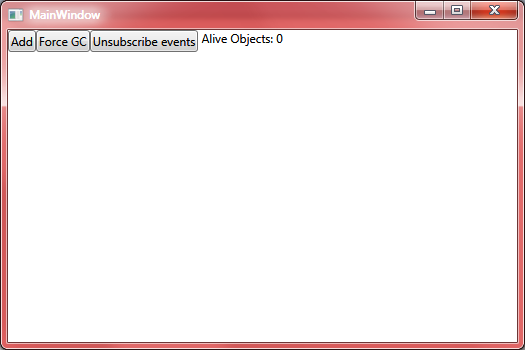 Events work by giving a delegate to the Source object for it to call when an event occurs. The delegate is tightly bound with a strong reference to the listener. Most of the time this works fine. A sloppy developer might never unsubscribe the events they register for, this isn't good but its not necessarily catastrophic. The listener object cannot be garbage collected until the source object is also a candidate for collection (again assuming no event unsubscription otherwise it would be). Eventually the source object will be garbage collected and then so will the Listener. Not timely release of memory but at least not technically a memory leak. A memory leak, at least IMHO, is when objects are never removed from memory and the memory is not reclaimed until the process is terminated. So not technically a memory leak right? Well it can be if your source object is a singleton or static effectively making it immune to garbage collection along with any object who subscribed to its events. Fortunately, in .NET memory leaks are far less frequent than in unmanaged code. Lets take a look at a demo of good and bad event handling. The application is made up of a Shell Controller and up to four child panel controllers. The Shell Controller is obviously going to be long lived even though it is not static, it is controlling the root of the application and therefore will not garbage collected until the process closes. 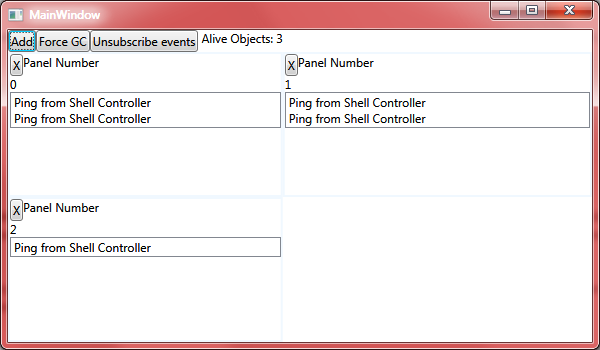 Clicking "Add" will add a new Panel to the shell controller and the UI. 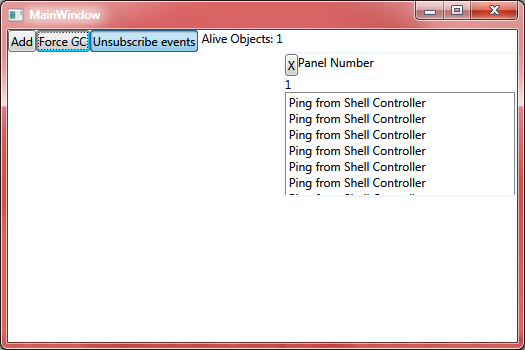 When the Panel is added, it subscribes to the Shell Controller's Ping event. 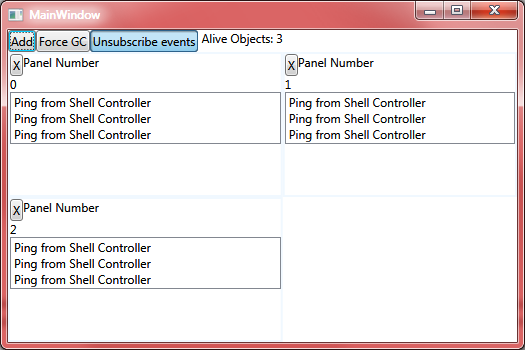 The Panel starts to receive the Ping event from the Shell Controller and displays the event as text in a list box. When the "X" buttons are clicked on each panel the panels are removed from the UI and all references to them are destroyed. This effectively means they should be candidate for collection right? No, because I did not unsubscribe to the Ping event for each Panel. Some developers think by adding code to the Finalizer (destructor) it will deregister the event when the GC collects it. No, wrong again. The GC calls the Finalizer and the object isn't a candidate for collection until the event is unsubscribed. As you can see in the above image the number of alive objects are currently 3. This is incremented when a new Panel is created and is only decremented when a Panel Finalizer is called, meaning the panel is being collected. Here I have removed two panels and clicked the button "ForceGC" to force an immediate garbage collection. As you can see the Alive objects still reads 3. 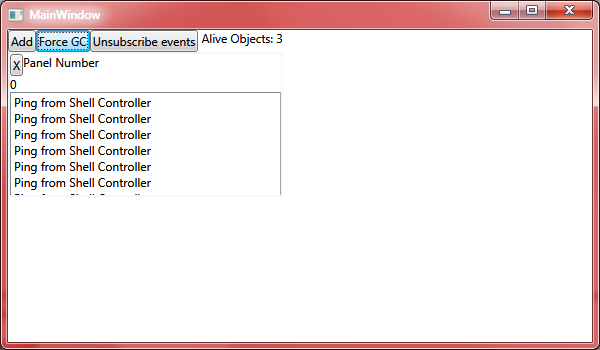 Meaning no Finalizer has been called to decrement the Alive Objects counter. The test application runs in two modes "Sloppy mode" or "Best Practice mode" this is designated by the toggle button. When the toggle button is depressed in, the application will unsubscribe from the Ping event when a panel is closed. 3 Panels created, the counter reads 3. Lets close 2. After removing 2, and clicking force GC, the counter immediately changes to 1. Excellent. Incidentally, if you wait 1-2 minutes it will collect by itself without having to force a collection. Hope this clarifies events best practice, with good evidence. There are some handy new classes in .Net 4 that allow weak events. See http://msdn.microsoft.com/en-us/library/aa970850.aspx. This is definitely my recommendation for use with WPF and an Event Aggregator, Attached Property, or Decorator, since these are normally implemented as statics or singletons. Ie, short lived listener subscribing to long lived singleton equals tight-rope-walk. Why host in a Console? Usually the intention is to host inside another application or a Windows service, and testing it inside a console a simplier than the real application. Why not IIS/WAS? 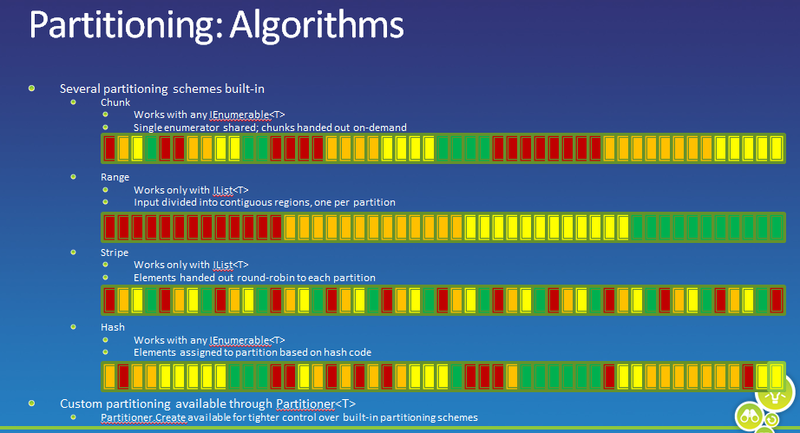 If you need to run long lived background threads hosting in IIS or WAS will have issues. The main idea is to safely host each service inside a using block and use a controlling thread to signal hosting threads to trigger shut-down. First I put all metadata for a service into an array of container classes. Then I can loop through and intitialise them, then wait for them all to come online. Once they are all signalling they have completed their initialisation, then the main thread can simply wait until the user is ready to close the console and thereby shut down all the services. There's a little noise in the code download, for things like dependency injection and WCF Data Services (OData services). RULE: Allocate an object onto the managed heap using the new keyword and forget about it. Once "new-ed", the garbage collector (GC) will destroy the object when it is no longer needed. The next obvious question is, of course, "How does the GC know when an object is no longer needed"? An excellent question. The short answer is that the GC removes an object from the heap when it is unreachable by any part of your code. When an object goes out of scope it becomes a "candidate" for garbage collection. Understand however that you cannot guarantee that this object will be reclaimed from memory immediately after an object goes out of scope and is no longer unreachable. All you can assume at this point is that when the CLR performs the next garbage collection the object will then be safely destroyed. As you will most certainly discover, programming in a garbage collected environment will greatly simplify your application development. In stark contrast C++ programmers will be painfully aware that if they fail to manually delete heap-allocated objects, memory leaks are not far behind. In fact, tracking down memory leaks is one of the most time consuming (and tedious) aspects aspects of programming with unmanaged languages. By allowing the GC to be in charge of destroying objects, the burden of memory management has been taken from you shoulders and placed onto the CLR. Effectively making us developers much more productive writing more business logic for less time. In fact you may never need to use a memory profiler tool to track down memory leaks ever again! NOTE: If you have any background in COM development, do know that .NET objects do not maintain an internal reference counter, and therefore managed objects do not expose methods such as AddRef() and Release(). If the managed heap does not contain sufficient space to host a requested new object, then a garbage collection run will occur immediately. When garbage collection takes place the runtime will temporarily suspend all active threads within the current process. The GC process has received considerable attention over the years and is highly optimised, and you will seldom (if ever) notice this brief interruption in your application. The GC maintain two distinct heaps. One for very large objects and one for all others. The heap for very large objects is less frequently consulted for collection, a good reason to follow good Object Oriented design principles and avoid very large objects. So will objects that have unmanaged resources be GC'ed? Yes, but you need to be sure to release and clean up an unmanaged resources, because if you don't the objects will be destroyed by the GC, but your unmanaged resources may not be cleaned up leaving things in an inconsistent state. To clean up unmanaged resources use a finalizer (destructor). RULE: The only reason to override Finalize() is if your C# class is making use of unmanaged resources via PInvoke or complex COM interoperability tasks (typically via the System.Runtime.InterOpServices.Marshal type). Remember however, you cannot predict when an object is going to be destroyed by the GC and Finalize() called. So if you have expensive resources that you want to free up sooner consider implementing IDisposable. 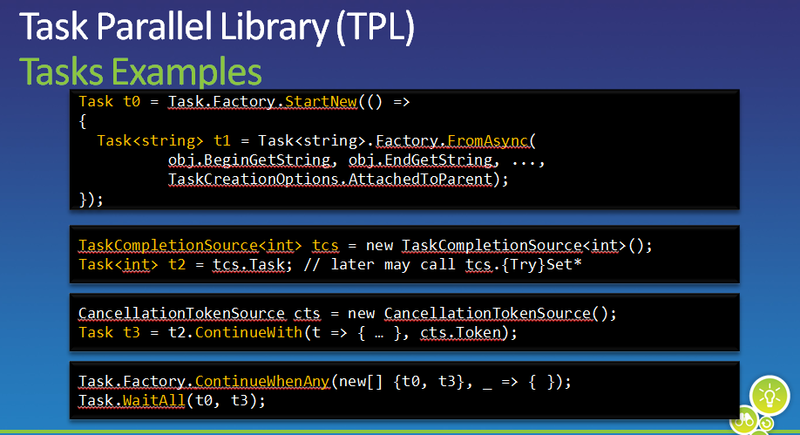 Include the *.ttf file into your WPF project as a Resource. I don't fully understand exactly what the # is doing, but suffice to say in this case it is followed by the font name not the file name. The font name can be found by double clicking the TTF file which opens it in the WIndows Font Viewer.